Pastor James continues the series, “What If God Wasn’t _________?”, exploring a world absent of God’s attributes. 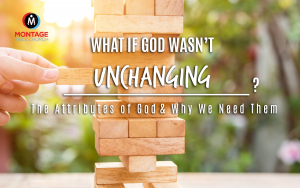 This week’s sermon is “What If God Wasn’t UNCHANGING?”. CHILDREN’S MINISTRY: Children’s classes will be available this week at Montage. While the adults get teaching time with Pastor James, our children will be enjoying a time of singing praises and learning Scripture with a great group of Montage volunteers.